Before it made the decision about the new region, the Department of Fisheries and Oceans said it held open discussions with the Inuvialuit and Inuit. But no one consulted with Dene communities on Treaty 11 territory. Dene National Chief Norman Yakeleya says the federal government left the Dene Nation in the dark during discussions about a new Arctic region. The Department of Fisheries and Oceans Canada (DFO) made the announcement on Oct. 24, stating that a new Arctic region means more coast guard services to the North, with a new coast guard base in Yellowknife.As well, it plans to move federal research facilities from Ottawa to the North. The new DFO region encompasses the four regions of Inuit Nunangat — the area Inuit traditionally occupied — from the N.W.T. through Nunavut, across northern Quebec and Labrador. It encompasses more than 50 per cent of Canada's coastline. The DFO said before it made the decision, it held open discussions with the Inuvialuit and Inuit Tapiriit Kanatami but did not consult Dene communities on Treaty 11 territory. Treaty 11 territory stretches 950,000 square-kilometres across the N.W.T., Nunavut and Yukon, including the coastline of the Arctic Ocean. Under the treaty signed in 1921, the Dene have claim to the land. Yakeleya said he was frustrated the Dene weren't included in initial discussions. "For me it's a step back to prior to 1960 where the Dene, our people weren't recognized as citizens of Canada. So we're going back in that direction and I fear that the federal government needs to be educated again," said Yakeleya. "This is 2018 and we were certainly left out of the boat in this new arrangement that they are making with our Indigenous brothers and sisters in the east." Jocelyn Lubczuk, press secretary for the federal minister of Fisheries and Oceans, said developing the new Arctic region is in its early stages and no official consultations have begun. "We are saying and reaffirming this new region will be driven by Northern priorities and that it's important we take this first step. This is a piece for reconciliation," Lubczuk said. "I think we need to look at the word reconciliation, maybe the Department of Fisheries and Oceans can have a workshop on partnerships, respect and reconciliation," he said. "Maybe the prime minister needs to remind his ministers there are other Indigenous governments that need to be brought into the process when making a new announcement." Yakeleya said his main concern is located "at the bloodline" of the Dene — the Mackenzie River. 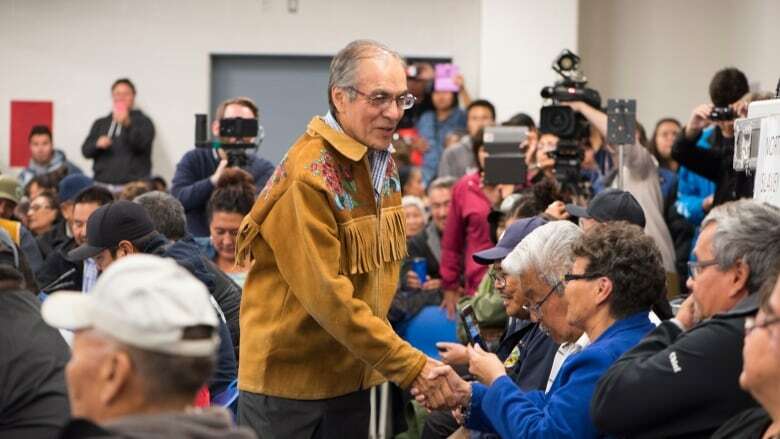 He said the announcement made by the federal government does not include collaboration with people who have spent "thousands of years" on the river, Great Bear Lake and Great Slave Lake, which he calls "arteries" flowing into the Arctic Ocean. "You want to make some changes into our life here and you're forgetting that the Dene Nation needs to be involved," said Yakeleya. Lubczuk said no boundaries have been made for the new Arctic region. The only plan that is set in stone is stationing the assistant commissioner for the Arctic in Yellowknife — a move she called a "refreshing step." "In the past the management of this region has been driven by politicians in Ottawa who think they have the good ideas, but in reality they don't understand the context of the North," she said. Yakeleya said he plans to meet with the five grand chiefs of the N.W.T. to discuss how they will move forward.